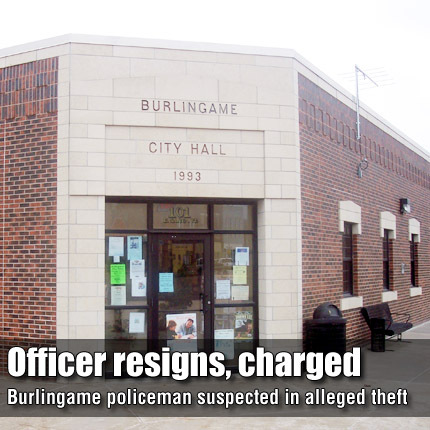 BURLINGAME—Monday evening, the Burlingame City Council accepted the resignation of a part-time police officer recently charged with burglary of a rural residence and theft of city-owned gasoline. The council had suspended officer Anthony Richman, 38, without pay during a May 20 special meeting. The Osage County Sheriff’s Office arrested Richman the next day. On May 25, Osage County Attorney Brandon Jones filed two counts of felony residential burglary, one count of criminal trespass, and 12 counts of misdemeanor theft against Richman. Ten of the theft charges allege Richman obtained gasoline from Burlingame Coop using a city-owned charge card, during a time period between Jan. 1 and April 24. The burglary charges allege Richman entered a rural Burlingame residence in December with the intent to commit theft; two of the theft charges allege Richman took property worth less than $1,000, including copper, a bed and a glass vase.